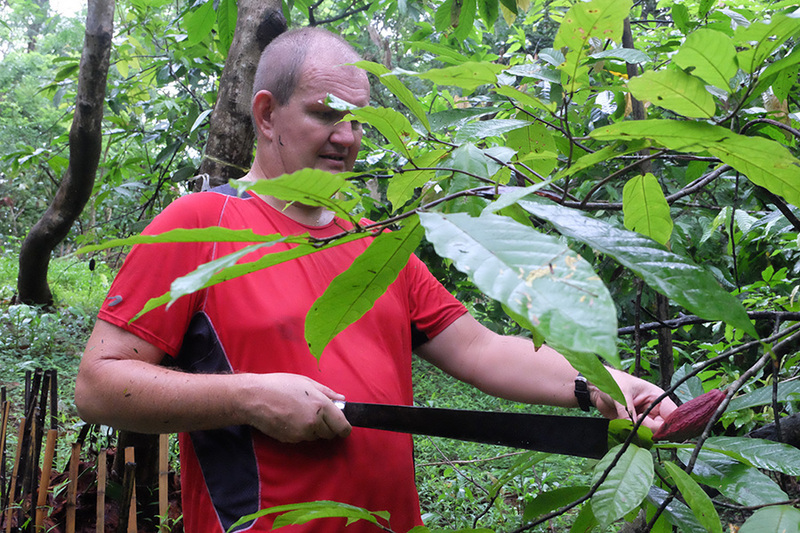 KAREN STATE — In dense jungle about 20 kilometers northeast of Taungoo, Jean-Yves Branchard hacks at thickets of vine with a stubby machete, pausing to contemplate a cacao pod blackened with disease. “The price you pay for being organic,” sighs the Frenchman, as sweat washes flecks of soil from his heavy jowls. Considering all the close scrapes—the soldiers, the dengue fever, the kidnappings—rotting fruit suddenly poses the biggest threat to his Yangon-based company, Ananda Coffee and Cocoa. But most of the pods from the 40,000 or so cacao trees growing freely on his 125 acres of land are lime green, magenta, butter—the tones of immaturity. Their leathery rinds will become more creased, shading maroon and orange, come the harvest in October. Jean-Yves Branchard, 51, examines an unripe cacao pod from one of the roughly 40,000 cacao trees on his plantation near Taungoo. Jean-Yves, 51, is a pioneer of Myanmar’s incipient chocolate manufacturing industry—in fact, he is the only one in it. He has traveled across the country, seeking the surviving cacao trees of a fabled government experiment, supposedly begun and abandoned in the 1970s or 80s, although there are no official records to confirm this. His pursuit to find conditions that could support the crop led him to the jungle near Taungoo after a government official recalled seeing the pods in the area. Ploughing through seven-foot wide dirt tracks lined with rubber trees and wild orchids, he eventually located the cacao trees, on territory controlled by the Karen National Union (KNU). Jean-Yves and his Myanmar wife bought the land from a private seller in 2004, he says, when there was “a tense situation” between the Myanmar Army and the ethnic armed group. “The army was always concerned about having a foreigner in the grey area,” he says, remembering an incident eight years ago when Myanmar Army troops received the orders to “pull him out” as fighting raged toward his plantation. He would sometimes be turned away at military and rebel checkpoints, or only allowed to access his land with security personnel, but his workers suffered the most harrowing episode in 2013—a year after the KNU and the Myanmar Army signed a ceasefire. The gang of armed men, says Jean-Yves, had come to log trees on his plantation, but were not associated with the military or the KNU. “We asked for help from the police and then the men released the people immediately. But it was quite scary for the workers: at night, AK out; it’s no fun, especially twice. It happened again two, three months after. They wanted to cut more trees,” he adds. 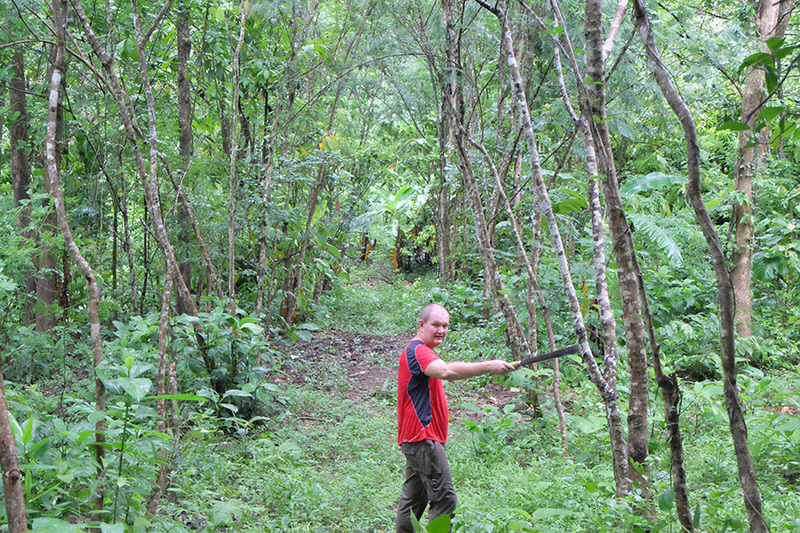 Jean-Yves located two more pockets of wild cacao trees. One was near Thaton Township, once home to an ancient Mon Kingdom, but the steep terrain made farming difficult. The other was near Kalein Aung village, about 90 kilometers north of Tanintharyi Region’s capital Dawei, where he began showing farmers how to cultivate cacao trees in between their areca palms, which produce the nut chewed with betel leaf across Myanmar. It was a successful pairing in an agricultural system more regimented than the plantation near Taungoo. In 2005 the French Embassy connected Jean-Yves with French oil giant Total, a major partner in the highly controversial Yadana gas pipeline that runs through Tanintharyi from the Andaman Sea to Thailand. A black cloud of accusations, including forced labor and land confiscation, hangs over Total for its role in the pipeline. Perhaps to counter this image, it launched a social enterprise initiative, which welcomed Jean-Yves’s vision as a way of encouraging sustainable living in the local community. Total lent Jean-Yves use of its plant nursery, agriculture experts, and even the odd seat on its private plane to the remote tail of southeastern Myanmar until the help fizzled out three years ago. Jean-Yves was hesitant to collaborate with such a contentious company, although he says he did not witness any of the alleged abuses. 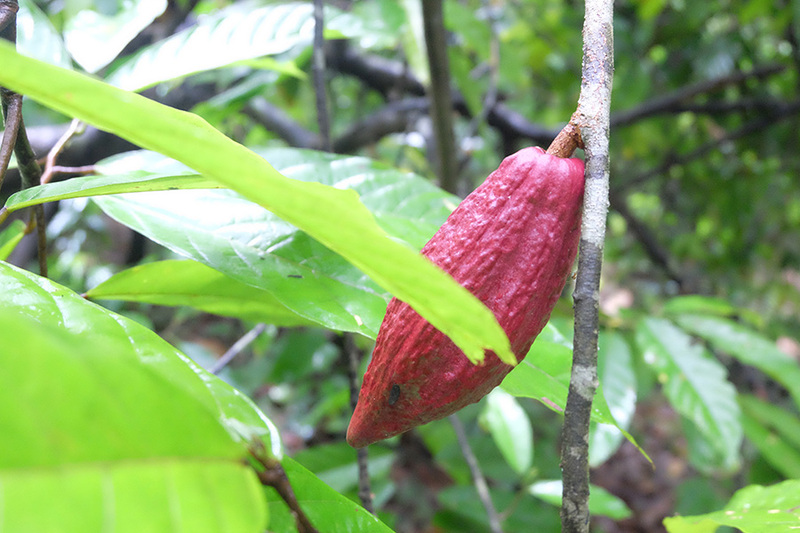 The farmers use four variants of cacao chosen from a batch of 15 types of seeds that Jean-Yves ordered from a French-government laboratory on the South Pacific island nation of Vanuatu. He claims to buy the cacao from the farmers for at least twice the global market rate. Once ripe, as they currently are in Kalein Aung, the pods are cracked open and the white pulp holding the 30-50 beans in each pod is scooped out and kept in large plastic barrels to ferment for up to a week, with about four pods’ worth of beans used for every chocolate bar. They are spread onsite in the sunshine in the dry season, but during the monsoon season are transported in 4x4s or on buses to Yangon, where they are dried and roasted in a big drum in Mingaladon Township for 30-40 minutes before the shells are removed. The remaining nibs are taken to North Dagon Township and ground for three days in a hand-built stone machine, tempered, and then moulded. The final result comes in six 100-gram bars: cashew nut and caramel, milk chocolate with 45% cocoa (the term used for the heated form of cacao), and four dark chocolate variations of 60%, 72%, 80%, and 100% cocoa. Jean-Yves describes a “relatively dry” flavor shared by the bars because he uses only beans from the fruit and avoids cocoa butter. Pleasantly hand-wrapped in plastic film, as if a relative had made them, the bars are then put in aluminum foil and paper packaging. The combined harvest of the two plantations produces roughly 20,000 bars to be sold at hotels Kandawgyi Palace and Park Royal in Yangon. Ananda also has a café in one of the city’s plazas, Marketplace, which serves other treats like dried orange peel dipped in milk chocolate. But Jean-Yves’s ambitious shot at galvanizing Myanmar into a bean-to-bar nation took an unlikely turn this year by attracting its latest and most famous customer, Daw Aung San Suu Kyi. He has the look of a man who has committed spans of his life to rugby, wine, and cheese, in that order. He has had dengue fever three times, and half-jokes that the next time will kill him. Time spent scurrying around malarial hotspots, however, seemed to pay off the day before Daw Aung San Suu Kyi, the foreign minister, left for her European tour on April 30. Jean-Yves received a phone call from the government in Naypyitaw ordering 120 bars to be delivered immediately to her house. The chocolate, says Jean-Yves, was handed out to the continent’s leaders and figureheads as a taster of Myanmar produce, meaning Britain’s Queen Elizabeth, who lunched with Daw Aung San Suu Kyi, may well have taken an Ananda chocolate bar back to her chambers. The next order from the government was for 200 bars to take on the foreign minister’s trip to Sweden and Canada on June 4, he adds, and there has been a further request for 500 bars to be delivered in early July. Chocolate runs in the Branchard family. Jean-Yves’ uncle began a firm importing cocoa from West African plantations in 1917 and his cousin launched his own chocolate factory. But Jean-Yves struck out on his own in the coffee industry after visiting Myanmar as a tourist in 1998. He met his wife in Bago Region and the newly-weds honeymooned in Hsipaw, where they visited the Shan palace of ‘Mr. Donald,’ the nephew of the last Shan prince Sao Oo Kya. Jean-Yves eventually bought land from the government near Pyin Oo Lwin to grow coffea, the plant that fruits coffee beans, and bought two plantations from private sellers after that. He has sold one and abandoned another because of hassle from Shan locals who begrudged foreigners working the land, he says. According to him, groups of drunken men brandishing machetes would storm one of the plantations, adding that they once accused him of trafficking a local woman. His court hearing was canceled when it transpired the girl had eloped with a Myanmar worker on the plantation, he says. She wrote to her mother explaining, and then returned. A shame to leave the plantation, he reflects, as people lost their jobs and the land is now derelict, but too risky for his own family. Yet the coffee business sustained its most serious blow when the US imposed heavy sanctions on Myanmar’s military regime in 2003 for rampant human rights abuses. Customers of his coffee beans—mainly shops abroad—began receiving complaints over their association with Myanmar firms; exports were blocked, banks refused to deal with him, and so the coffee stopped. In response, Jean-Yves and his wife, a tour guide, started a tour agency, with the Frenchman using his Land Rover and experience of the country’s routes to show visitors distant places. He advised the local administration in Mogok, a city in the hills of Mandalay Region famous for its precious stones and gems, on agricultural matters. Finding an interest in Mogok’s stones, he completed a diploma in gemology in 2012, but he saw his future business in chocolate. “There is a nice potential to grow cacao from the south of Moulmein to the south of Myeik city, but the land mass is not that big,” he says of the region between Mon State and Tanintharyi. “There is a long stretch of land and already a lot of rubber plantations. We will start but we will always be competing in this area with rubber, a big business in Myanmar. For now, Jean-Yves is grateful not to have any other competitors producing chocolate in Myanmar—and he doesn’t expect them any time soon, either, because of the hard work involved. With Yangon’s top hotels and the government showing interest in his work in the last six months, more than a decade of cacao farming is coming to fruition.